Experience gracious living in this beautiful, professionally custom designed Dorval single family home constructed by Stock Signature Homes. Situated on a premier lot at the end of a quiet cul-de-sac with a exceptional view of the lake and golf course. Inside this 4 bedroom plus den, 4.5 bath home features a bright open plan with 18' vaulted ceilings in the great room, gourmet kitchen, study, dining room and wet bar, and large air conditioned flex room. The high tray ceilings, custom woodwork and paint accentuate the attention to detail and exceptional quality of materials evident throughout the home. 16' pocketing sliders open to adjoin the great room and the outdoor living area with expansive travertine lanai and custom oversized pool and spa. 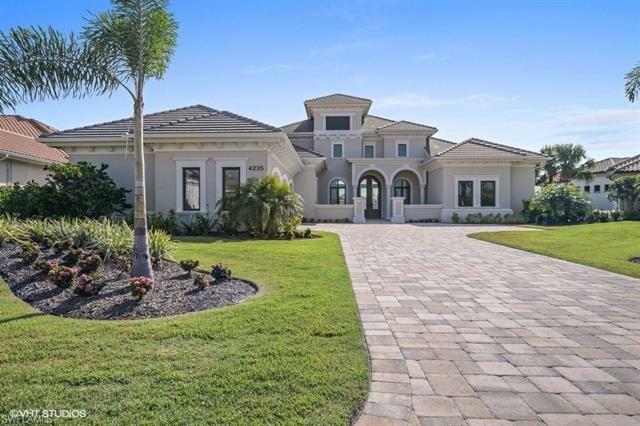 Day or night enjoy the large covered lanai areas with custom cypress wood ceilings, fireplace and outdoor kitchen. Superior amenities await you in Quail West including 2 recently renovated Arthur Hills designed 18 hole golf courses, a new standalone state of the art 2 story fitness center, a fully renovated 70, 000 square foot clubhouse plus a private beach club. The sellers have paid the community improvement assessment in full.